10 Selma Ala. June 18th 1865 Sunday Detailed Officer of the Picket Guard. Posted on Cawhaba Road being Senior Officer. 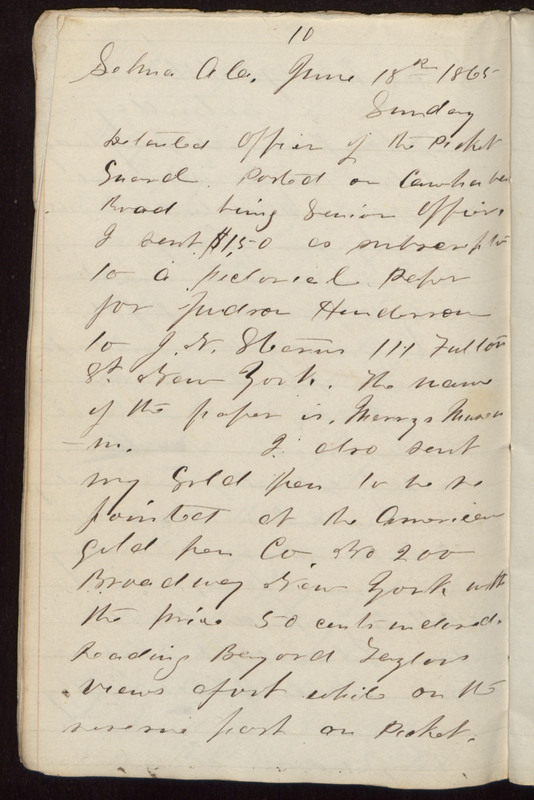 I sent $1,50 as subscription to a pictoriel Paper for Judson Henderson to J. N. Stearns 111 Fulton St. New York. The name of the paper is, Merry's Museum. I also sent my Gold pen to be re pointed at the American Gold pen Co, No 200 Broadway New York with the price 50 cents enclosed. Reading Beyond Taylors Views afoot while on U S reserve post on Picket.